Last Saturday was not a good day for transportation, but for once the bad news was not about aviation. An immense cruise ship — the Costa Concordia — capsized in the Mediterranean Sea off the west coast of Italy where rocks near the shore sliced open the ship’s hull with Titanic-like fury. Most of the 4,200 people are accounted for and while nearly a dozen people lost their lives, any losses were needless and simply compounded by some actions of the crew. The captain told the BBC and Italian television that he believed they were sailing a few hundred meters from where the rocks were charted and that he had no idea why the ship ran aground. Surprisingly, large ships use the same sort of GPS guidance and autopilot systems we see on board an aircraft, systems designed to prevent just such a mishap … unless of course some human gets in the way. On board, cell phone videos captured the panic among the passengers as they sought safety. The real story of this accident though is how a ship of this size in 2012 could run aground despite millions of dollars of safety equipment designed to prevent just such an accident. Back to the crew again as reports have emerged that Captain Francesco Schettino and many of his staff abandoned ship before all the passengers were accounted for. So it would it would seem that the captain was either lying through is teeth or was simply incompetent. The captain has been jailed adding fuel to the international debate of personal liability for crew negligence in such a crisis. Not all violations are quite so clear. The aviation industry has seen such cases, mostly outside the United States. Continental Airlines is s till appealing a European court’s decision that held them liable for a part that fell from a DC-10 during a July, 2000 takeoff from Paris CDG. 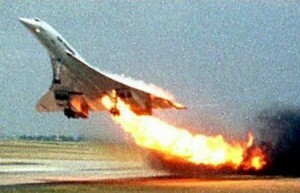 That part fell to the runway in the path of a departing Concorde and is claimed to be responsible for the firery chain of events that ended with the crash of Air France 4590, near Paris Le Bourget. There are certainly parallels of responsibility in aviation, for even the pilot of a Cessna 150 or a Piper Warrior. We are always responsible for the safety of all aboard their aircraft. Like the soldier’s creed — “Never leave behind a fallen comrade” — as pilots, as human beings, we owe it to the people we fly to give our last breath if need be to save people who put their trust in us. All too often in flight training, the idea of responsibility focuses on how to navigate, how to communicate and how to operate the aircraft itself. I NEVER remember a discussion about responsibility in any aspect of my flight training, perhaps because most people assumed that sort of talk was unnecessary. But watching the behavior of Captain Schettino and some of his crew as they scrambled ashore knowing there were still many people unaccounted for is simply unconscionable, so perhaps we do need a reminder. When people climb aboard your aircraft, be it a two-place trainer, a Cirrus SR-22, a Falcon, or a A380, they’re entrusting you, the Pilot in Command, with their lives and the lives of the people they love. We owe it to all never to forget that awesome responsibility … ever. At United Airlines, Does Making Money Trump Safety? This entry was posted on Thursday, January 19th, 2012 at 10:51 am	and is filed under Air Traffic Control, Airlines, Airports, aviation safety, Business Aviation, FAA, Flight Training, Light sport aircraft, The Buzz. You can follow any responses to this entry through the RSS 2.0 feed. Both comments and pings are currently closed. A good captain, like Chesley Burnett “Sully” Sullenberger, would never leave his command until all were accounted for. 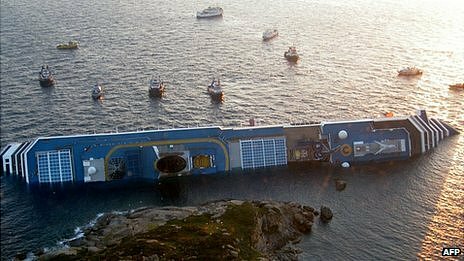 You suggest that Captain Francesco Schettino “was either lying through is teeth or was simply incompetent.” I suggest both. Command should never be given nor taken lightly. It is as you point out an assume responsibility. Schettino deserves jail time as does the captain that certified him. It could have been far worse, I am thankful it wasn’t. Command should never be given nor taken lightly. It is as you point out it is an assume responsibility. Passengers are the customers at the end of the day. They need to have a positive experience and what the crew of this cruise liner did was very bad & unprofessional. Actually I believe that being PIC in a small aircraft is AS , if not MORE, important to the passengers. In a jetliner much of the safety aspects of the plane AND the skill set of the pilots is ASSUMED. In a small GA aircraft…NOT SO. It is the PIC’s responsibility to not only DELIVER a safe flight to his/her passengers but to also alleviate the passengers normal fears SIMPLY by acting professional at all times and assuring the passengers, thru YOUR ACTIONS AND WORDS, that all is well. I remember an Angel Flight (actually AirLife Line back then) of mine a few years back. I was transporting a Mom and her daughter from KPWK to KPTS. There was rain predicted in the Pittsburg region but nothing major. During our flight the rain became intense with quite a bit of thunder/lightning visible way, way, off to the east. There was no convective activity in our immediate vicinity so I decided the continuation of the flight was a safe decision. My IFR skills were current and proficient and I had to take into consideration the need of the daughter to make her surgical appointment on time. While the flight, to me, was uneventful (save for the pounding rain and fairly poor visibility) the Mom was clearly nervous. I kept my voice light and even during ALL ATC communications and never let the smile leave my face. At one point, about 15 minutes from landing, she asked me – with a noticeable tremor in her voice – if “we were going to be OK”. I smiled even more and told her that there was NOTHING to be worried about and that we would be landing in less then 15 minutes. I saw her search my eyes as I responded…and I could SEE the level of discomfort and fear abate. At that point she put her trust 150% in me and, based on my attitude and words, realized she had NOTHING to worry about. During that Angel flight I owed her and her daughter two things; a safe flight to their destination and a feeling of security during the course of being my passengers. I believe I delivered on both counts. As Rob states, in the above article, IT’S ALL ABOUT THE PASSENGERS. AT ALL TIMES! I have believed that, as a bedrock truth, from the time I took off with my very 1st passenger. Now if I only could learn how to read my own log book. The destination, in Pittsburgh, for that Angel Flight was KAGC, NOT KPTS. Sorry for the mistake! It seems to me that there is some concern in the whole transportation industry lately on “professionalism” of which “responsibility” is a big part. Many aviation magazines are carrying articles on the subject. This is probably the result of a number of recent accidents in which the crew members could not or did not function in a professional way. Is this a general malaise in the population? Back in the old days before GPS and glass cockpits, we seniors and Captains tried to make this an important aspect of the training of new cockpit residents. Is this no longer being done in the age of automation? I agree with you entirely Rob. All we are taught in flight training (Part 91) is to show the passengers how to fasten the seatbelt and open the door. I suspect that more information is imparted on the move up to Part 121 or Part 135. Alas how many CFIs do we have with such experience-not many I suspect. I guess I’m not sure whether it is a general malaise as Paul put it, but in all the Saturday morning flying club breakfasts I sit in on and then aspects of flight training I regularly see and hear discussed, the Pilot in Command concept may occasionally pop up, but seldom the meat of the discussion … as in how that means the pilot is actually expected to behave. As someone mentioned to me in a private e-mail, I failed to include a salient fact in the Costa Concordia tragedy. As the ship began taking on water, the crewmembers making the PA announcements were telling passengers not to worry and that there was nothing wrong. Whether they actually knew the facts or had been told by the boss what to say matters little to me. In a crisis, tell them the truth … as calmly as you can … but tell them the truth. When you’re in charge and playing with people’s lives, those passengers have a right to know. Great post Rob, and some excellent responses. I think we’re seeing a lack of professionalism because we (pilots) have lost sight of what it means to ACT like a professional. Perhaps it’s because the pilot profession has lost its luster? Perhaps it’s because some groups feel as though they aren’t treated with respect by their management? … There’s no one answer, but I firmly believe that if we treat others like they deserve to be treated (like a professional), they will act like one when the time arises. Great post Rob, but I also believe that it does not just apply to circumstances where an emergency or crisis is prevalent, but also to all aspects of a flight. Before a flight in GA I am sure to explain to my passenger what to expect, what to look out for on the active, and just in general what to do when there is an emergency. Once all that is out of the way there is no reason not to enjoy the flight, and you know that your passengers understand what is going on. In Commercial operations I believe Jeff hit the nail on the Coffin, just remain calm, and reassure. I learned to fly back in the day when many of the instructors and others that hung around airports were old school commercial or former military pilots. The desire to behave and perform in a professional manner was ingrained in me and my contemporaries. Even though I have never been in a position to get paid for flying my passengers around, they, and their safety, comfort, and perception, were always my number one priority. Captains, both air and sea, were once held in the highest regard. Unfortunately that has been lost. As a training aid, any person who will be in a position to command while serving passengers, should be required to study the well documented flight of Captain Sullenberger and First Officer Skiles. They set an old school example of how to behave during a crisis and also in the media blitz that followed!